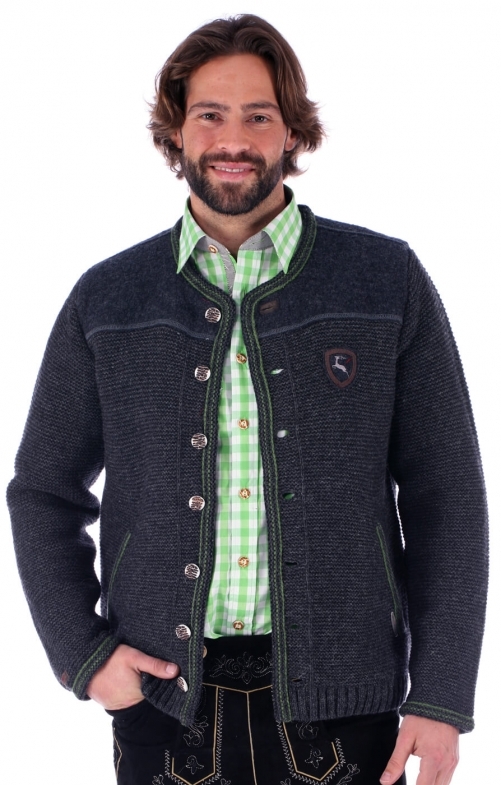 This cardigan by Spieth & Wensky combines classic design with modern details. Of course, functionality is at the heart of the garment design, while the knitted structure gives the fabric plenty of feel, as well as warmth and volume. There are large, felt inserts on the shoulders, while cuffs and pockets are highlighted with a splash of grassy green colour. The buttons have been designed for a traditional, horn-effect look, while an appliquéd coat of arms and embroidered antlers attract the attention to the centre of the back. On the left-hand breast, there is another appliquéd coat of arms with a traditional stag symbol. This simply cut cardigan can be combined with traditional folk dress as well as everyday looks. Gute Qualität, fällt etwas größer aus, angenehm zu tragen.